This may come as a a shock to any regular readers, but not every film that I write about is lost gem. Nope, it’s true. Not even Hell Comes To Frogtown (Episode XI). Sometimes, my selections are simply films that dropped off the radar yet that I feel are worth revisiting. Today’s selection falls into a particularly unique area I want to examine- An ‘Almost Movie’. An Almost Movie is one that has all the ingredients to be great, but turns out decidedly average. Palookaville (1995)has the dubious honour of being my first such selection. Palookaville covers familiar ground to better known films such as Welcome To Colinwood, Small Time Crooks, and a smattering of Ealing comedies. 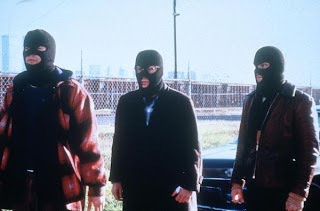 It is a comedy-drama concerned with the aspirations Russ, Sid and Jerry, three low level criminals. Palookaville focuses on each of their shambolic lives as they prepare for a robbery far and away outside of their amateur ambitions. In fact, it is disingenuous to even describe Russ Jerry and Sid as low-level criminals. They are beneath even that. They’re so down the criminal ladder they’d need a step ladder just to reach the bottom rung of the first ladder. Russ, Jerry and Sid are more akin to everyday folk with nothing to lose and flexible morals. Sometimes I think he looks handsome, sometimes I think he looks like an alien. No wonder he modelled. Set in mid-90’s New Jersey, Russ lives at home with his overbearing mother, his sister and his despised brother-in-law, Ed. Ed, is a cop which only adds to their natural distrust of one another as well as fuelling extra tensions at home. Russ is motivated by a grand sense of ego combined with a lack of privacy or respect at home. Russ is very much the driving force of the group as he desperately seeks a new life. In contrast, Jerry is seeking to stabilise his own home life. He is an unemployed carpenter struggling to support his wife Betty and their child. Betty works as a cashier at the local supermarket and is the sole provider which weighs heavily on Jerry’s own mind. Finally is Sid. Sid is completely broke and lonely. He lives with two dogs that he struggles to feed. Sid obsess over a divorce form a decade ago and pours all his remaining energy into looking after his dogs . Sid is a man in need of anything to remind him what living is really like rather than simply surviving. At the start of the film, we witness the threes bungled attempt to dig into a Jewellery store. Instead they dig a hole in the wrong direction and end up in a bakery. Crumbs! After narrowly escaping the police response units, Jerry swears off any more attempts at crime. He wants to be there for his wife, and their son. Forgetting about crime, he and Sid try to get a private taxi company going in a bid to stay legit. However when rival Yellow Cabs get violent, the trio are forced to slam the brakes onto that plan. Settling back into their desperate lives, Russ, in a moment of affection/foolhardiness, promises a girl that he is seeing a new life together in California. Simultaneously, Sid receives an eviction notice making him almost destitute, and Jerry finds Betty is being sexually harassed by her manager at the supermarket. Jerry takes matters into his own hands and the end result is that Betty is fired. The trio are now in more dire straits than ever when, somewhat serendipitously, they end up saving an Armoured Courier’s driver from a heart attack. The courier’s job is to transport the takings from the Supermarket. Soon a ‘perfect’ plot is hatched to steal money from a deserving victim, but what could possibly go wrong??? Waving his beg red pistol around! Well given this is a comedy about chumps, quite a few things go wrong that involve Ed, a guard dog, and a drill. Ultimately the would-be criminals do not rob the truck. Instead they end up hailed as civic heroes. They never get their riches, but they do gain a little self- awareness about how far they are willing to go ethically. A little self-realization is their sole reward, but it seems the film leaves all three in marginally happier places than at the start of the film. Whilst the plot itself is not particularly original, this is not a problem. Straight away this entire concept of amateur criminals/desperate men is a good set up for any comedy-drama. The crime aspect allows for both a black comedy in tone, as well as the possibility of broader comedy on its action scenes. This conceit also allows for desperate characters to be placed under immense stress. This can be either dramatic or comedic, depending on what is needed. With all of this in mind, it would seem that the trick to pull off a good comedy-drama based around low lives would seem to be two-fold; Firstly, have a script that allows for the necessary character beats. Secondly, gather a cast that can bring a mix of pathos and levity to their roles. Well, sadly for Palookaville it is in this aspect that it becomes an ‘Almost Movie’. Palookaville certainly succeeds with the casting but it fails at the scripting. The most shocking thing about a comedy named after a famous film quote* is that it does not feature any memorable lines, let alone great barbs of humour. In fact it could almost be a full-on drama except for the constant times that the heavy-handed clarinet score comes in to remind the viewer how to feel. The most quoted line from this film that I could find between Google, IMDB and Youtube is the line ‘A momentary shift in lifestyle’. This is Russ describes committing a one-off robbery. This is a perfectly good line, but if that is the most featured line in a pop-culture sense then it is safe to say the script does not sparkle off the page. It may seem perhaps a little unfair to base a critique over how quoted a film is online, but honestly the lines themselves do not get any stronger in Palookaville. ‘A momentary shift in lifestyle’ is as strong as it gets. Not bad by any means, but hardly a stinger of a one-line jab. However, for any dialogue or incidents that fail to really pop off of the screen, the casting at leasts get the most out of Palookaville. The core-trio of Sid, Russ and Jerry are played three very respectable character actors. Sid is played by the intense William Forsythe (The Devils Rejects, The Rock, Things To Do in Denver When You’re Dead) Russ is played by the infamous Vincent Gallo (Buffalo ’66, The Brown Bunny, Tetro) and Jerry by working TV actor, Adam Trese (Homicide: Life On The Street, The Sopranos, Rescue Me). Oh, and Oscar winner Frances McDormand (Fargo, Darkman) crops up a few times too. This trio play to their respective strengths, really giving their parts a sense of life. The character of Russ is a whiny, pushy character who believes he is smarter than those around him. Sid is stoic but clearly depressed, and Jerry is an everyday guy just down on his luck. Given these sorts of characteristics it is no wonder then that Gallo excels at being a frustrated neurotic, Forsythe a strong, silent backbone and Adam is easy to relate to as an Average Joe. I have watched this film a half-dozen times in total. This is down to the cast. Gallo et al make this film completely watchable, but conversely each time I do watch it, it is frustrating to think how much better the same cast would be with a wittier screenplay. It is unfortunate that Palookaville never completely gels. The drama itself is not moving enough, nor the humour biting enough. But make no mistake, Palookaville is still a perfectly solid watch. In fact it is somewhat fitting that the pleasant-mediocrity of the movie matches the notions within the film itself; You don’t always need to excel. Sometimes it is OK to be average if you can truly appreciate all that you do have. The next Hollyweird can be summed up in two truly glorious words…. ‘Rapping Shatner’!!!!! * I won’t actually cite the movie quote. Any cinephile should know and anyone else can Google it. Previous PostBLOG: YTC_Hollyweird: Episode XVI: Silence Is GoldenNext PostBLOG: YTC_Hollyweird: Episode XVIII: Holy Shat!